Snow started falling sharply on Monday, January 14th & continued into the 15th. Both days I was teaching in a local school. On the Tuesday, on arrival to teach two year 6 classes of 10-11 year olds, some inspiration came before the class arrived. As the idea hit me, I promptly made a snowman about a foot tall & hid it behind the doorway entrance to the mobile classroom. I waited for my year 6 class to arrive, then to their surprise took the snowman into the classroom placed it in a tray and drew it in front of the year 6 class to demonstrate shading. They had to draw a snowman too but had to design their own character in 15 minutes. I asked them the question is all snow white? They realized that there were lots of tones of grey too. 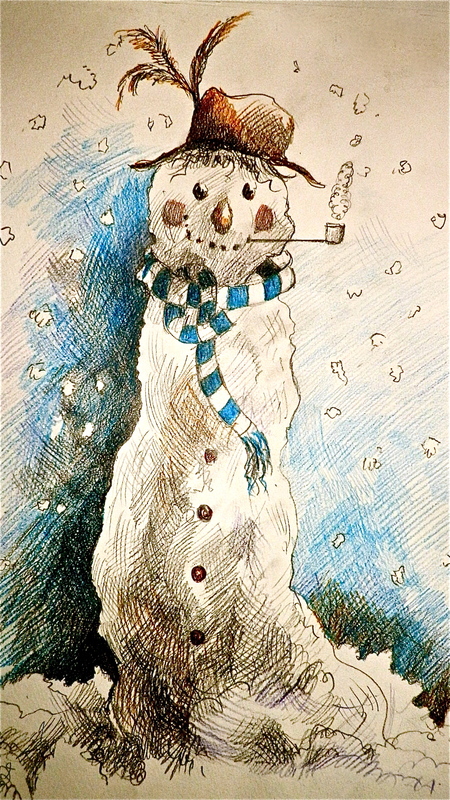 We exhibited the work & the best snowmen illustrations were awarded a prize. This idea seemed to go down well & it was good fun & improvised with the ‘white stuff’ outside. Nothing like being spontaneous with the weather, eh! 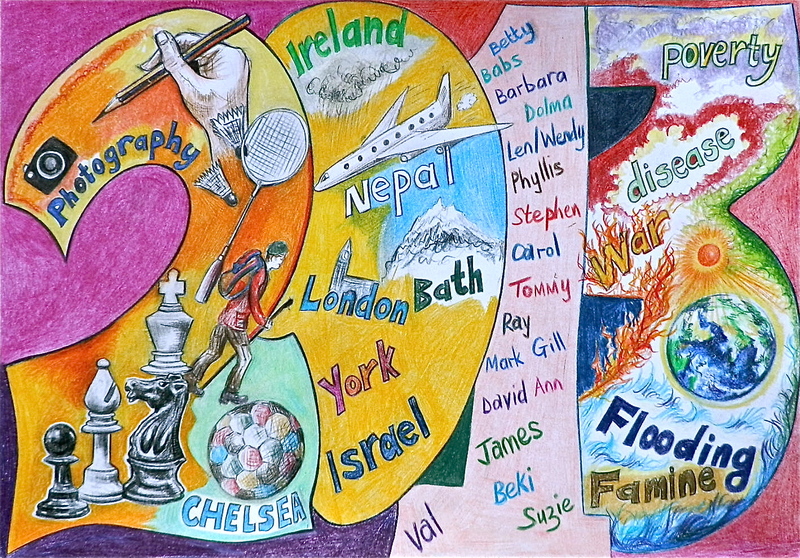 We then carried on with our portraits that were started the previous week. 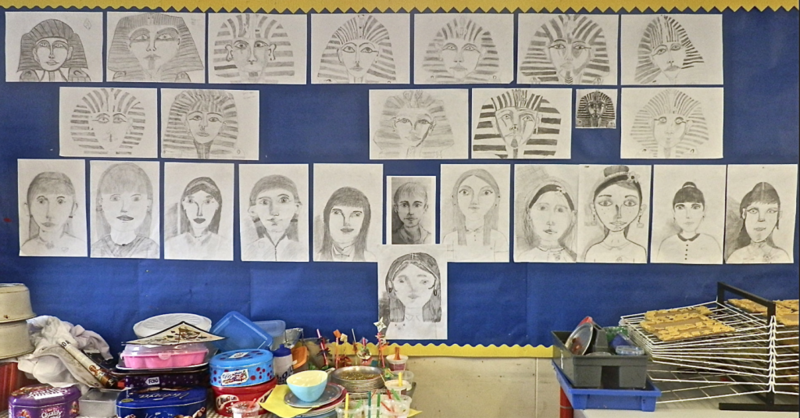 Yesterday I was working with year 5’s on the death mask of the Egyptian pharoah Tutankhamun. King Tut as he is commonly known, died at a young age of 19 years. He was actually suffering with ill-health during a most of his life & prior to his death had broken his leg. He was known to have had malaria at least once & was disabled with a club foot. His tomb was unearthed completely intact in the Valley of the Kings, complete with death mask, walking sticks & other treasures. I was teaching them how to do portraits & applying it to Egyptian history. The mask I saw in exhibition in London in the 1970’s when it toured various countries as part of an ancient Egyptian exhibition. The mask is no longer permitted to leave Egypt as it is deemed too fragile to travel. Tomorrow, I am teaching in another school a mixed age range from year 3 to year 6 [junior ages 7-11]. I will be teaching them how to draw a lion’s face using photographic reference from a successful days photography at a wildlife centre in Tenerife [in my sabbatical last summer]. The plan will be to go from pencils to colour pencils over several weeks & produce something attractive & of a high standard. I will upload completed illustrations to go with each creative teaching example I have mentioned. Below is the lioness illustration after the first lesson, the early marks are good, however, there is along way to go. 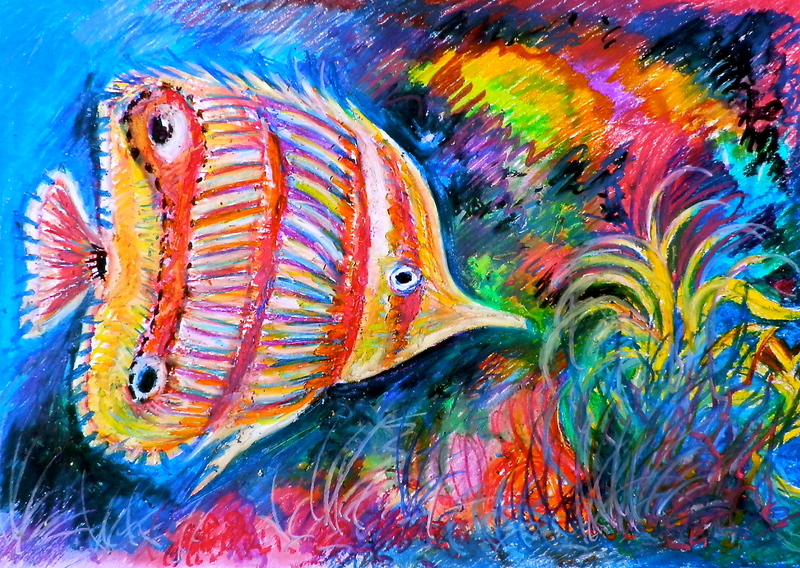 An underwater sea scene in colour using oil pastels on A3 paper. The finished work was vibrant colours and movement. 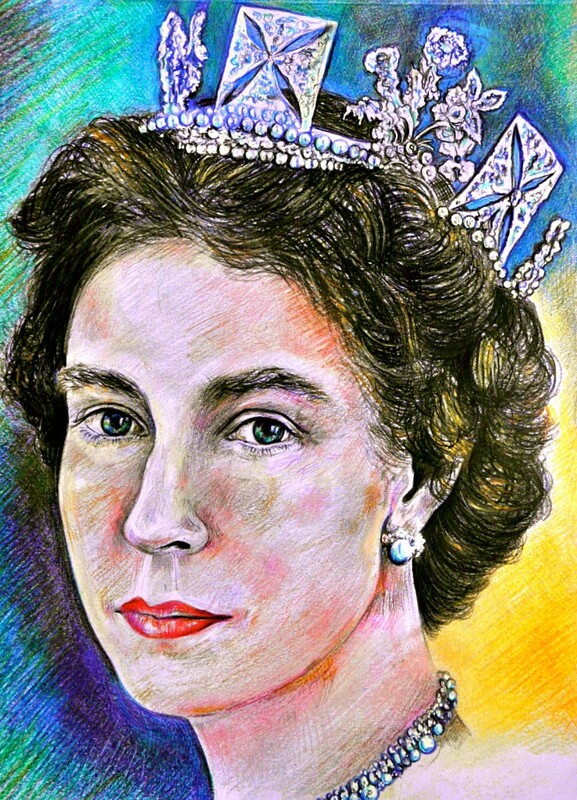 Oil pastels can be messy and are not so good for fine details, however, the strength of this medium is the ability to capture bold colours and make dramatic visual statements. The children enjoyed their bold colour experiment, although most found this one hard work. 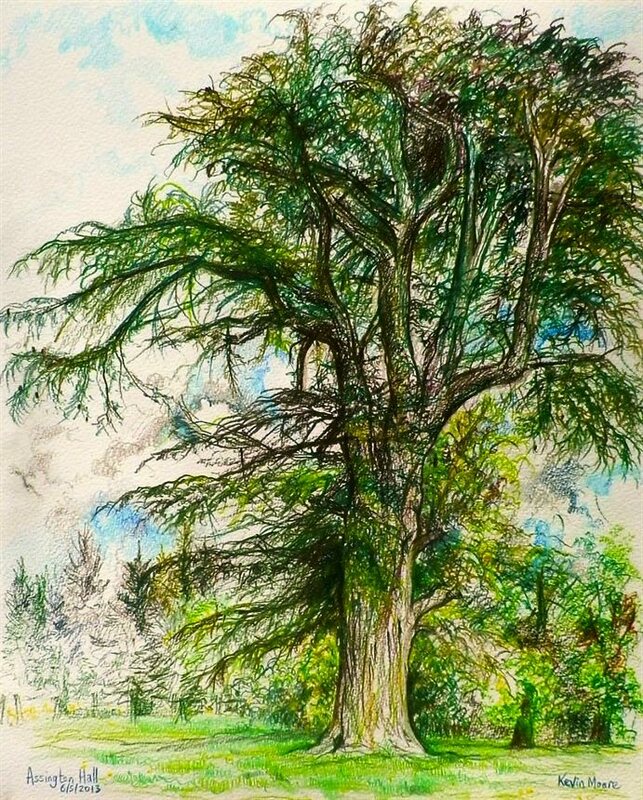 See the TEACHING GALLERY for more art pieces & photos of work done in the teaching field over the years in schools, prisons, residentials & churches. 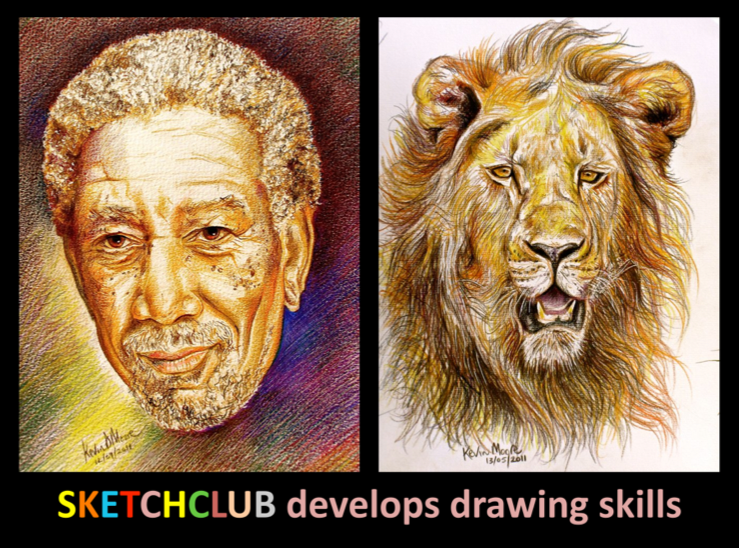 Thursday will give me the opportunity to work with 9-80 year olds at Sketchclub. Last week we warmed up with some life drawing before we drew the flower displays in the church as a still life challenge. 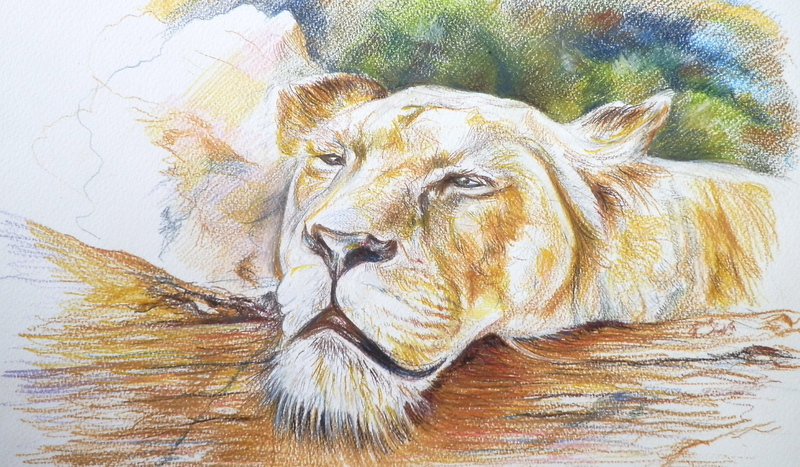 This week we will be illustrating a resting lioness using colour pencils. 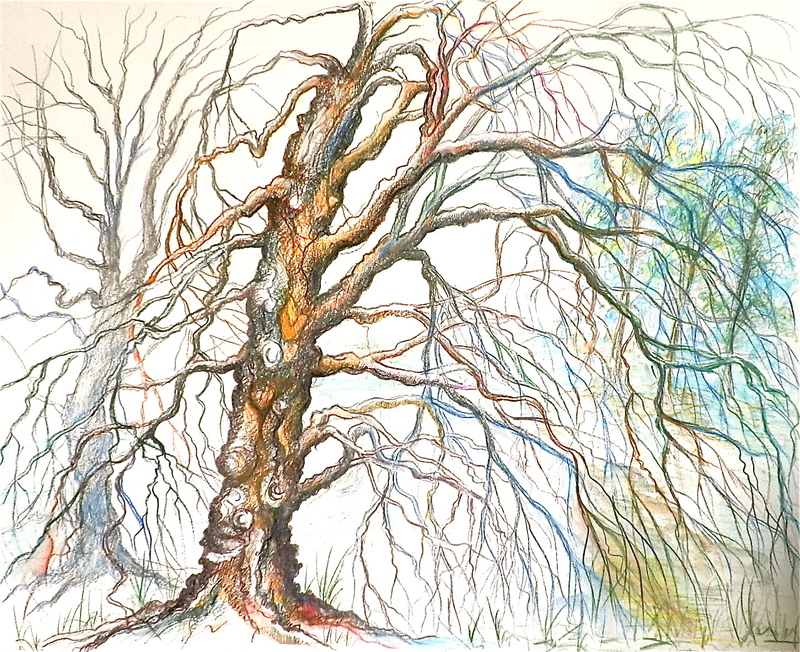 I will be demonstrating how to use colour pencils to great effect. This project will last several weeks. So you can see that teaching is fun & creative teaching is particularly inspiring. I love developing people’s confidence & abilities, whatever the age range. We have been working on some still life object drawings in colour pencil. 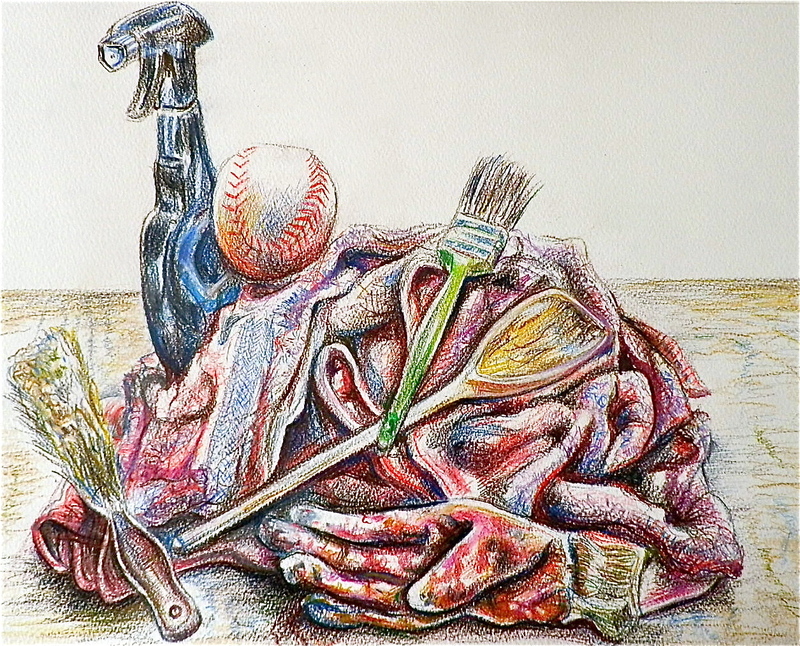 Using water soluble pencils to enable the wash technique to be applied at a later stage. This is an example piece done recently before any wash has been used. 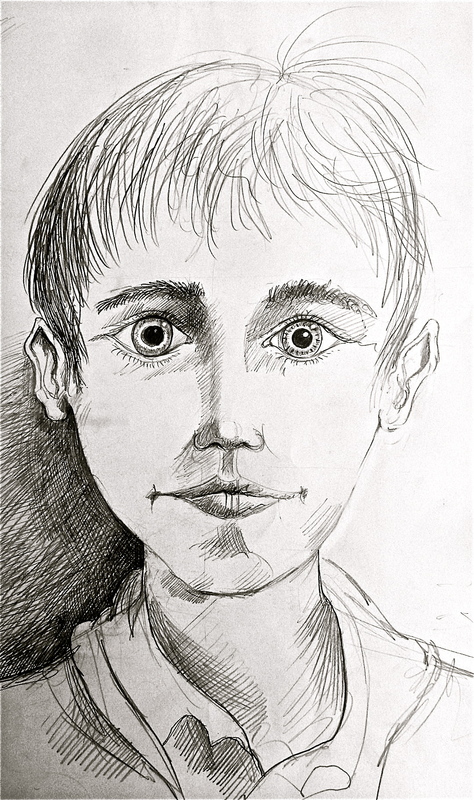 We have undertaken projects on portraiture, looking at the facial features, eyes, noses, ears, mouth. We have focused on the technique of shading & use of flowing lines for hair. 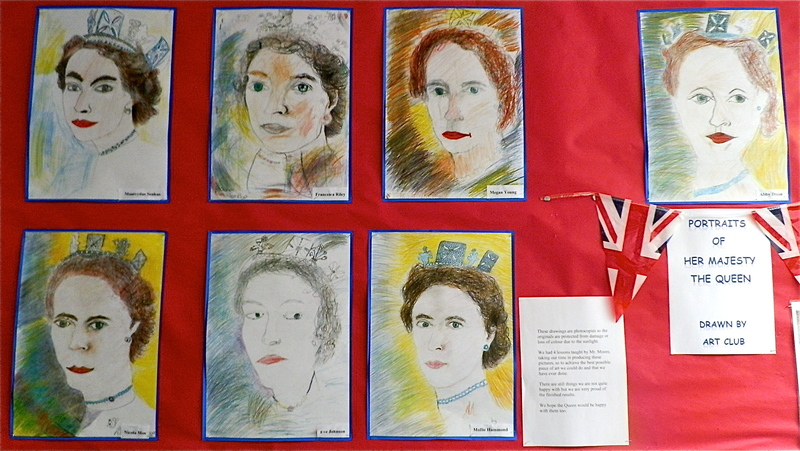 A healthy portrait display was exhibited in the school classroom on completion. 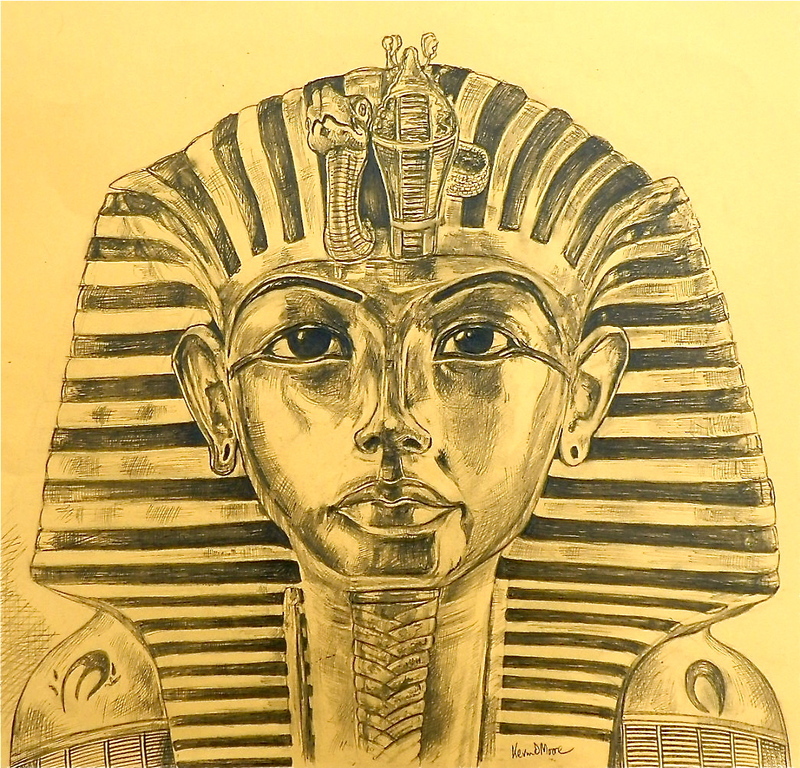 I will add some work done on ‘King Tut’ with junior aged children [year 5’s] that caused me to research into the life of the young teenage Pharoah. The death mask recovered from his undisturbed tomb showed lots of treasures including many walking sticks, illustrating his disability. Today, I showed a class a nearly finished King Tut portrait, there collective response was one of ‘wow’ and standing applause, it was very moving. … After a month the King Tut project was finished. I looked at the work and awarded prizes to the best pieces and they are now on display in the classroom for all to commend. It is fun taking children on an artistic journey, beyond where they have been before over some weeks. After the holiday we will start on a new theme. 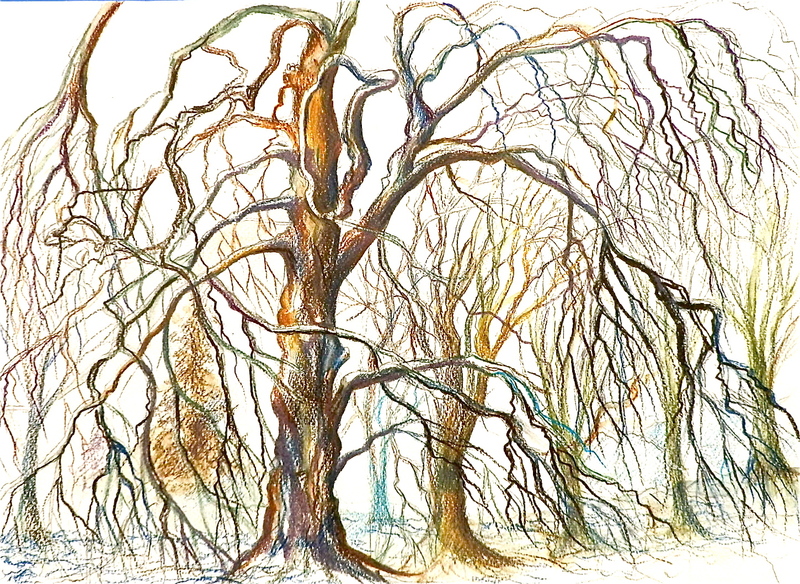 The theme of trees is an inspiring one teaching children to observe the movement of the limbs and branches and capture colours within the tree. 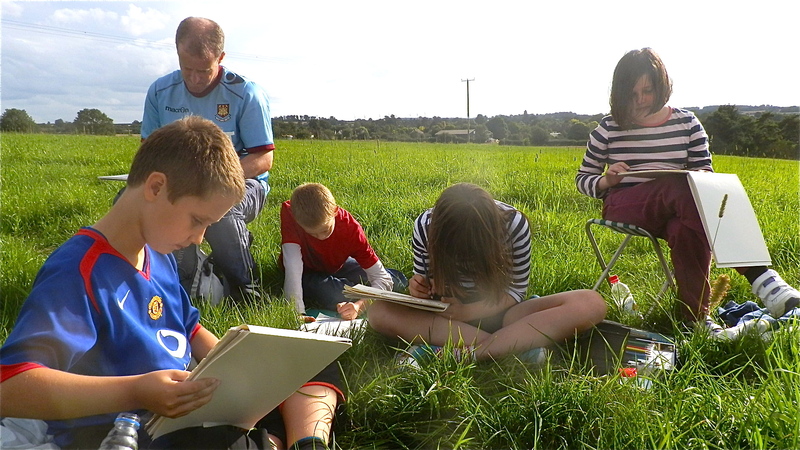 We spent some time drawing trees in the school playground and field, observing types, height, shape, colours. Just how boring would the planet be without trees! For a month we worked on soft toys and my daughter kindly supplied me with a varied resource to take into for the students to draw using colour pencils. 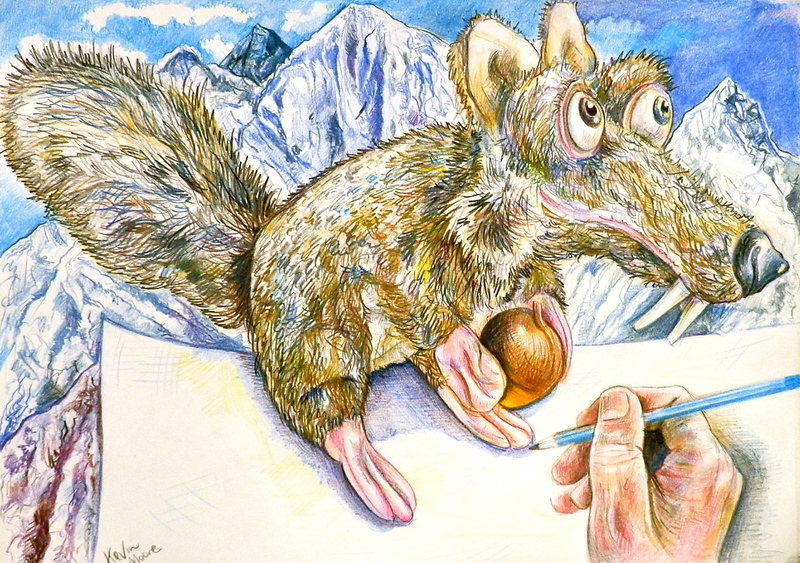 This is one that I finished off at home starring my friend and much loved Scrat, who features in the Ice Age films and is always looking for nuts. 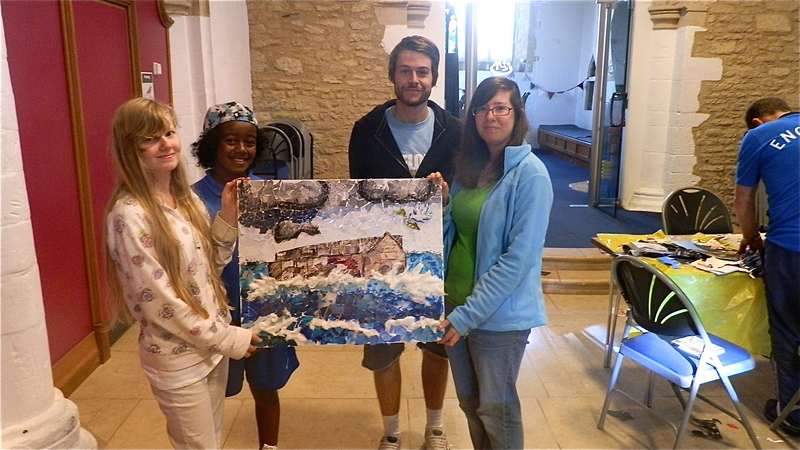 Working with children gives you the opportunity to take them on an art journey exploring uncharted territory. After some weeks they are thrilled to see the progress they are making on their piece of work. 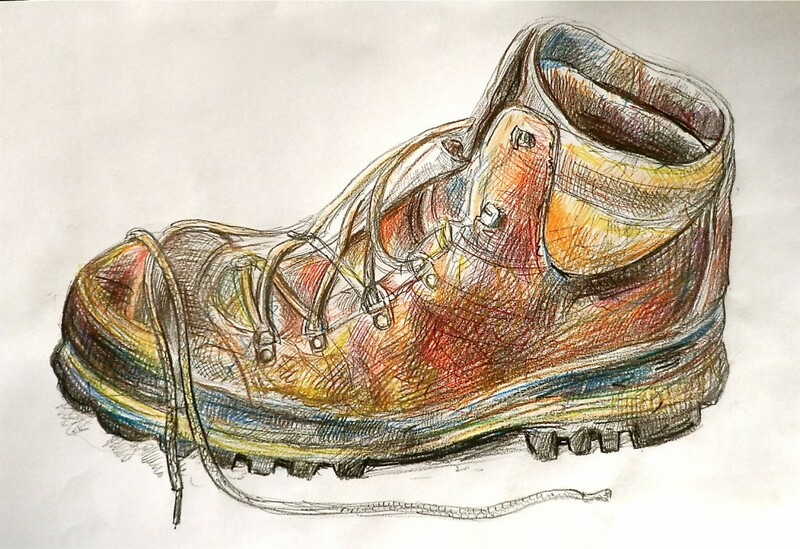 My Wainwright walking boot using school colouring pencils that are somewhat limited in range. Nevertheless you can show the children you can produce some decent art work. This was around an hour in length and forced me to improvise with the colours. 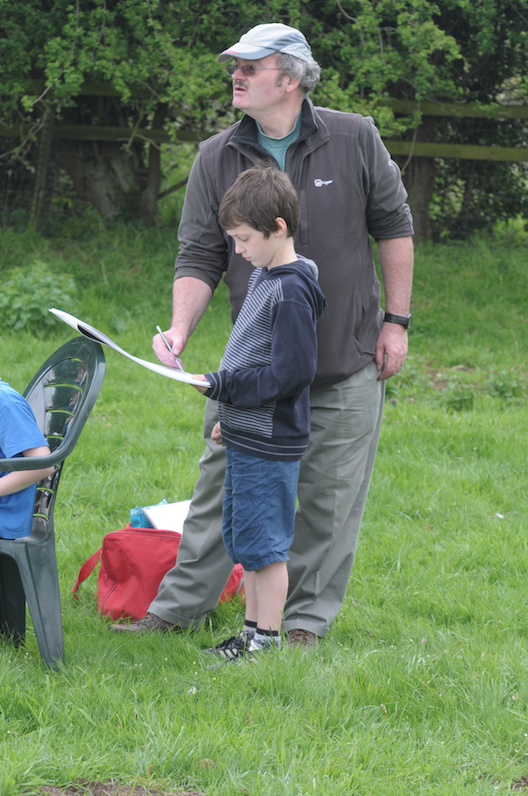 Helping children observe accurately is part of the battle and teaching them to focus is a particular challenge. Many children today, watch so much TV and find concentration for any length of time very hard. You have to find ways of stimulating their interest, I adopt various tactics, adding some competition into the proceedings normally helps. A wonderful visit to one of my favourite beaches on the South coast at Joss Bay, caused me to come away with a bag full of shells. After a clean up, they provided a great resource for some class teaching with 20 plus children. 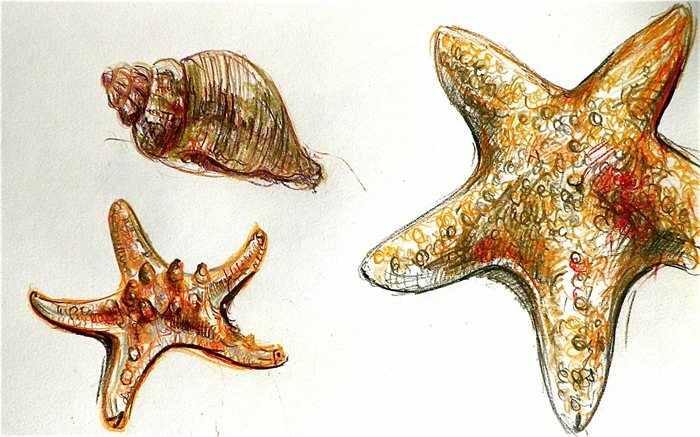 We draw and swapped throughout the lesson to record some shell studies. These studies could be then used as reference for a beach painting. Teaching forces you to be resourceful and continually look at things creatively. Practicing your artwork is important to compliment teaching your subject in the classroom or studio. As a student I could tell a mile off, the lecturer who was still practicing their skills and producing new work. They definitely maintained a sharpness and freshness in the way they taught their pupils and I vowed if I went into teaching to do the same. 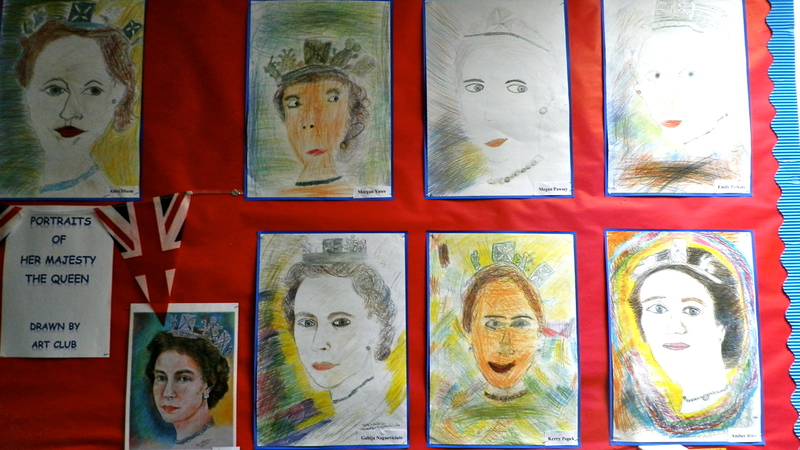 My demonstration royal portrait in front of a class of children plus teaching assistant over a period of 5 weeks. The finished gallery made impressive viewing. Many of the children were amazed at the standard of work they produced and gave them belief that they could do it in the future. An enjoyable project using art and design to create a poster on the year. This involved thinking about the content within each number, using words and pictures, colours and composition. The number three included some concerns you had about the world, and the number one, featured some of your hobbies and interests. Children present their work at different times during the project to help them communicate, in words, what they might want to communicate in pictures. 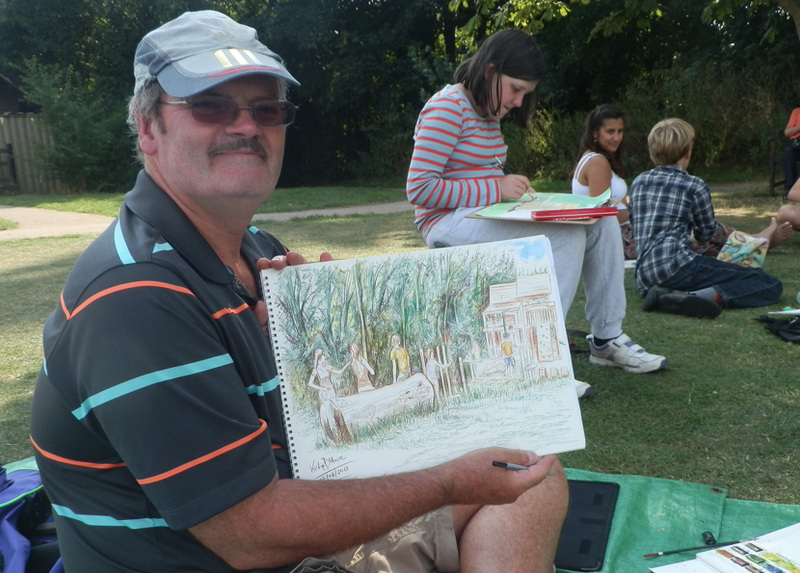 Kevin runs several creative days each year for all ages at Assington Hall in Suffolk. 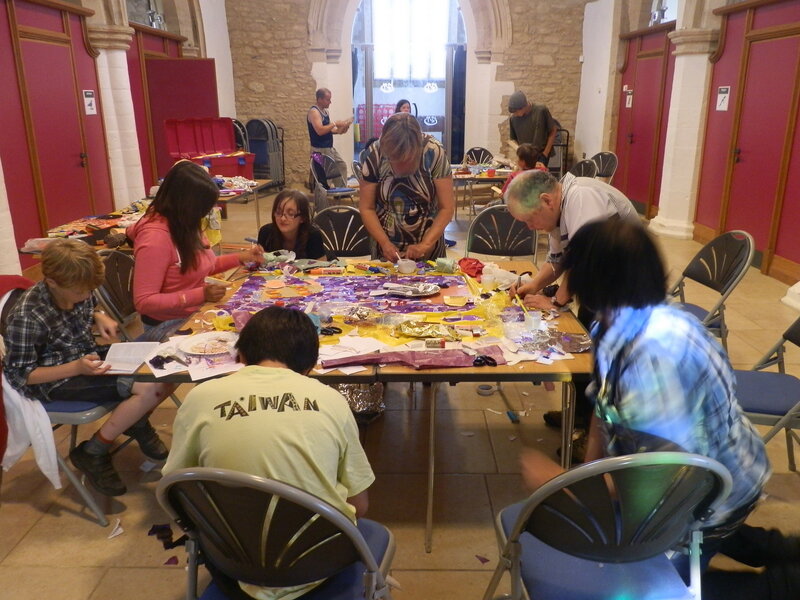 These are suitable for people interested in art and keen to produce art work on the day. 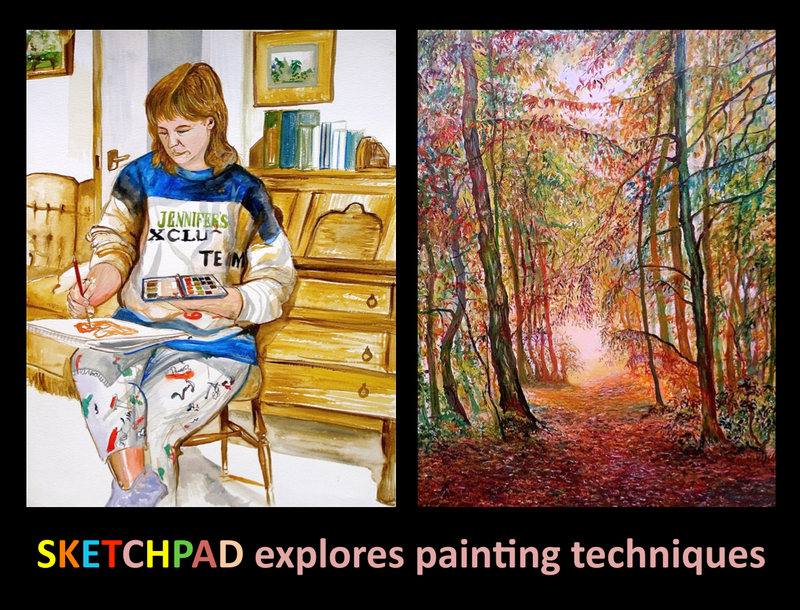 SKETCHPAD is a national art based holiday for young people aged 9-17 years. This is a unique, creative week to explore all kinds of media from pastels to watercolours, pencils to charcoal. 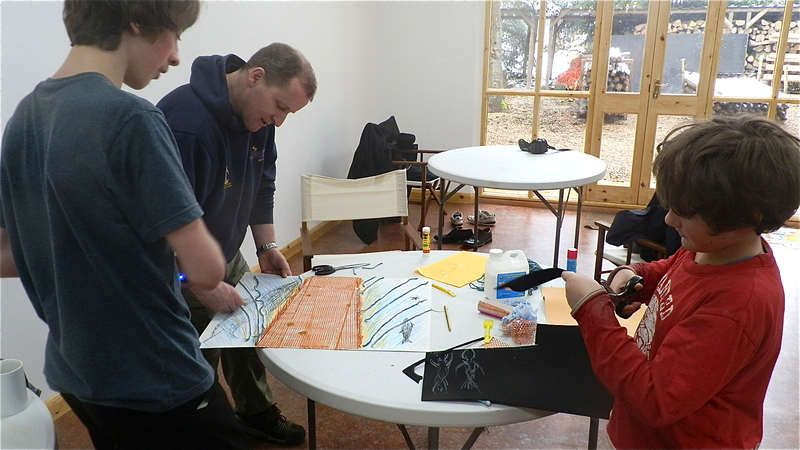 The holiday is ideal for those young people who are keen to develop artistic skills and techniques and make new friends. 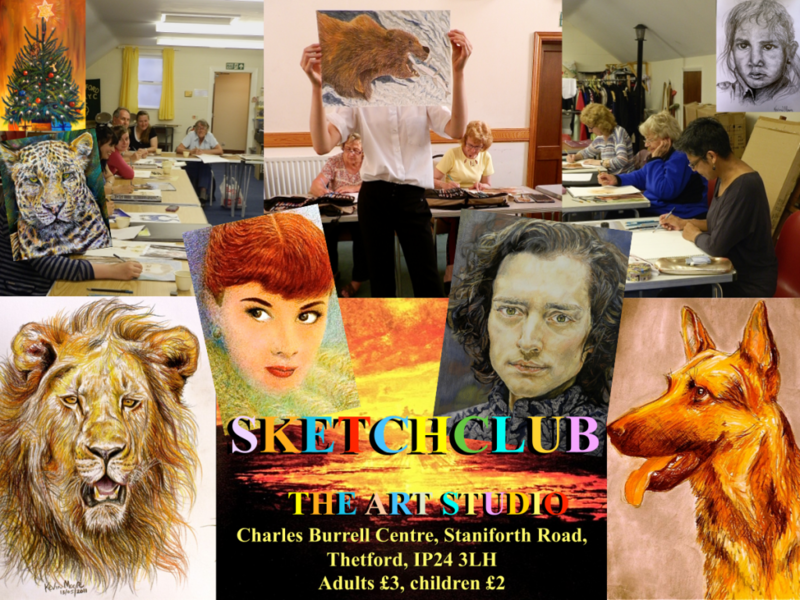 Contact Kevin for further details and download the Sketchpad booking forms.